After many years of bleaching and dying my hair, and with the additional heat that we girls insist on using as well as the not-so-lovely English weather has left my hair well very damaged as you can imagine. 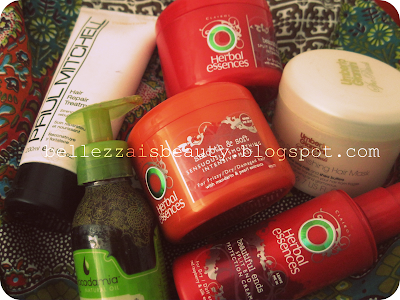 As well as doing the 4 week no heat challenge I am also trying to treat my hair to weekly 'treatments'. Some products are of course better than others so as well as this being a hair care post it is also going to be a Wednesday wonder about which hair repair treatment is best. Firstly today I went to superdrug and they have half price herbal essences products!! I brought these both for £1.95 due to that they were half price but originally they are £3.99 (so still quite cheap). The beautiful ends one smells like raspberries, the rest of the collection also does - I also own the beautiful ends shampoo, conditioner and the protection cream which you will see later on. The other products are quite good the shampoo and conditioner did make my hair feel soft but it doesn't really help split ends like it claims too. The smooth and soft one smells like oranges, i've never tried any other smooth and soft product so i'm not sure how good they are. The next hair mask that I have is one by Umberto Giannini the moisture replenishing hair mask this costs £5.61 for 200ml. As you can see i've used a lot - which leads you to think oh it must be good if shes used a lot...well, nope. You know those times when you buy something and you really really want to like it? but you don't..yeep that happened! I really dislike this product it isn't good at all, the only good think about it is the tub, it's pretty. And i will probably use it in the future for something else. This product claims to be 'a real wonder product giving not just great hydrating results but a texture that is weightless and loose and a sublime blow dry result'...it isn't like that at all it leaves your hair limp and lifeless it is greasy looking and it makes your hair feel very dry (the reason you buy a hair mask in the first place!) and it takes you more time to blow dry your hair, also the smell is very over powering it stays in your hair for ages and it's all you can smell ugh it's not nice. 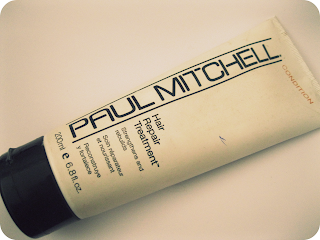 Next product is the Paul Mitchell hair repair treatment which ranges in prices from £8 to £30 however I brought mine for £7.12 because it was in a sale at a local hair salon. Like the others you get 200ml worth of product; however instead of a tub this one comes in a tube type packaging. This product really didn't do anything at all for my hair. It did not help soften, detangle, or moisturize my hair and it also left it hmmm stringy if that makes sense. For the price of this I am very dis-pointed and I am very glad that I didn't pay £30 for this! Next up is Macadamia natural oil (healing oil treatment) this I guess is sort of like the Moroccan oil you get 125ml of oil in this product. The product itself ranges in price from £8 to £30 I paid £28.09 - this is the most expensive hair product I have ever brought! The product does smell very nice, but it makes your hair quite greasy if you use too much of it. I don't think that it actually does anything to the hair it just kinda sits on top of the hair making it feel smooth, I also think that for the price it isn't worth it. I'd rate this maybe a 4 out of 10 because it does leave it feeling soft-ish. So I hope that the herbal essences products will be good. But nothing seems to work for my dry hair...does anyone have any good products?